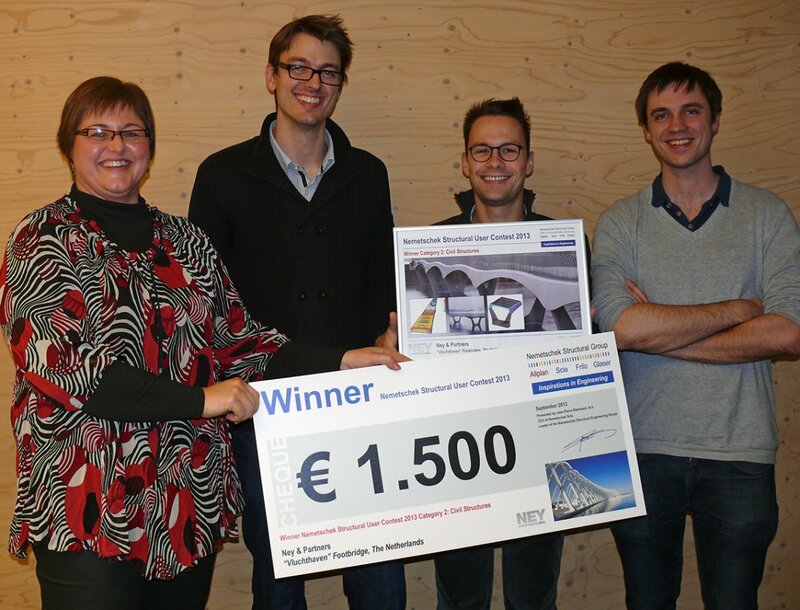 The design for the Vluchthaven footbridge provides for an object that stands out for its graciousness and oneness. In a departure from classical engineering, our concept was to limit the hierarchy of the elements by merging several functions together into one whole. The Vluchthaven bridge is an example of integral design: the deck, cross members, main beam and the finishing are one. The bridge is conceived as a single curved and cutout plate. Inspired by the elegant movement of a heron’s wing during flight, the plate is slightly torsed around its axis, representing the backbone of the bridge. As a result, the form of the bridge evolves: the cross-section at mid-span is concave while the opposite happens above the supports, with the cross-section convex. This way the necessary constructive height is achieved on supports. It gives the Vluchthaven bridge its wave shape, admittedly modest, but sufficient to provide a visual experience and rhythm. 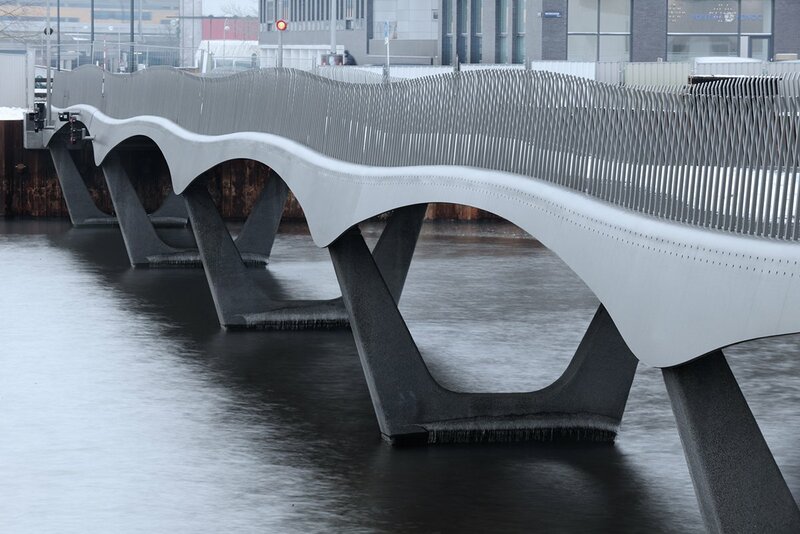 The bridge’s light wave shape, referring to the light waves on the IJ lake, is structurally optimally used, and is continued in the design of the railing. This consists of a series of vertical elements following the wave. The absence of horizontal lines in the railing, additionally accentuates the shape of the bridge deck. This gives the entire bridge a calm and moderate rhythm. LED lights are embedded into the railing. 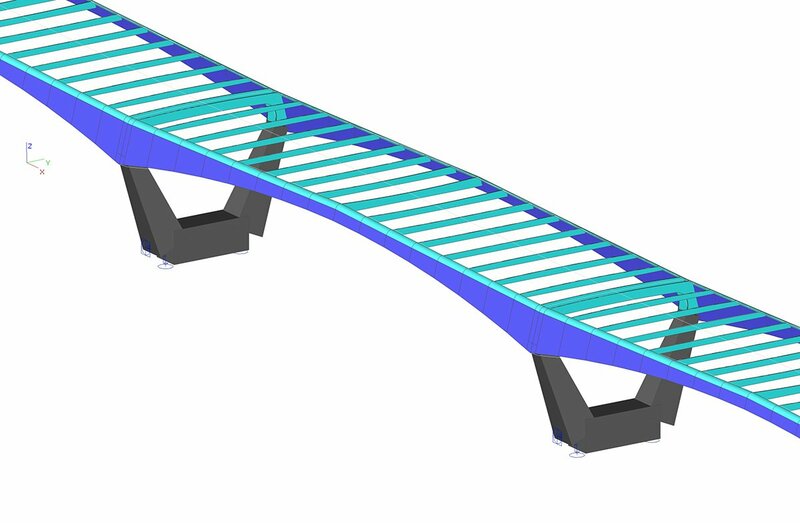 The mobile part of the bridge has been designed integrally with the bridge. While closed it is hardly visible. Through the use of the ‘import dxf/dwg’ function, the 3D contour lines of the geometry have been uploaded. While tracing the imported lines and nodes, the curved plates were generated in the model. Making use of a custom XML-tool we modeled the 98 load cases for the traffic loads. 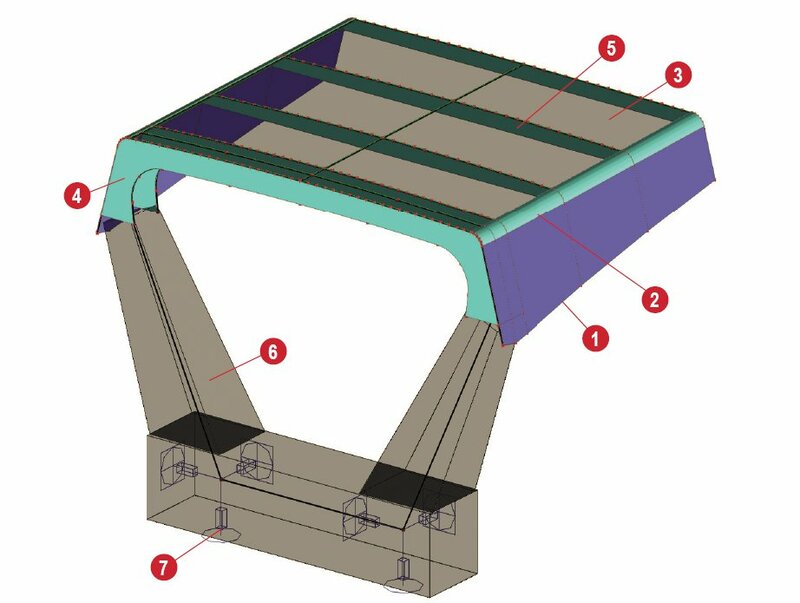 The specific form of the stiffeners above the abutments could be modeled with the use of the ‘cut-out’ function. Also the flat stiffeners follow the geometry determined by the wave of the deck plate above. Because it is a mobile bridge, along with the closed situation three open versions have also been modeled to calculate the effects of the wind on the structure during the opening and closing. With the ‘Productivity toolbox’ the entire plate geometry has been exported in table form into the calculation note along with all the results of the linear calculations. The ‘stability analysis’ was used to estimate the buckling behaviour near the support on the complete 3D model. 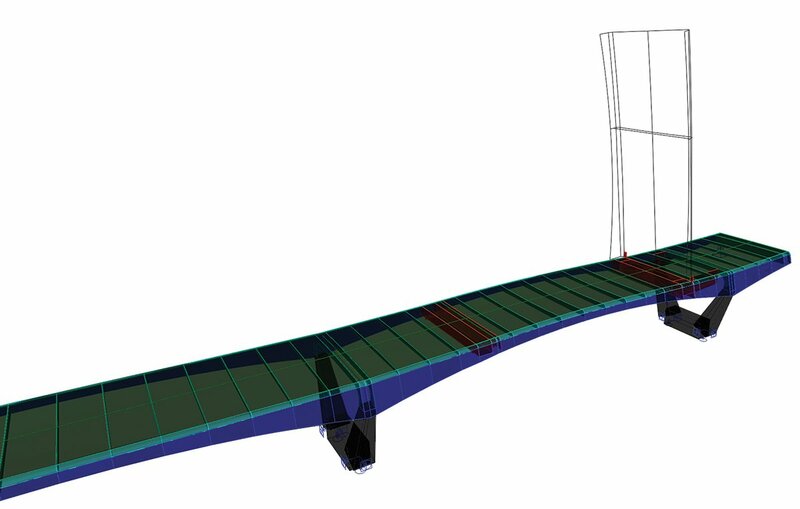 To investigate the vibratory behaviour of the bridge, the permanent part of the bridge was analysed with the use of the ‘Dynamics analysis’ function, using the full 3D model.